The Range Rover Evoque sent a shockwave through the automotive world when it was launched for 2012 thanks to its stunning, concept car–aping styling that instantly made it a high-profile fashion accessory. 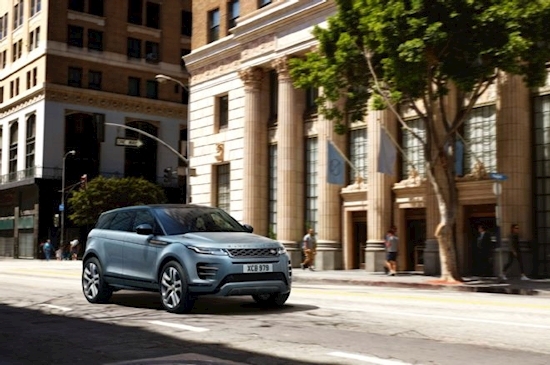 Its chop-top roofline; massive wheel openings placed at the corners; and available three-door and five-door bodystyles have locked the Range Rover Evoque’s place in history as a sleek and stylish mode of transportation for socialites and young professionals. The convertible, added in 2017, only furthered the nameplate’s style-above-all mystique. Now, after eight years on the market, Land Rover will extensively redesign the entry-level Range Rover for the first time, but if you’re expecting a total styling revolution once again, you’ll be disappointed. The 2020 Range Rover Evoque instead keeps its now-familiar shape and bodywork, teased and tucked in a few places to prove it’s all new. Under that slinky skin is a pair of powertrains: the standard 246hp, 269–lb-ft 2.0L turbocharged I-4 is carried over from 2019, augmented by an optional 296hp, 295–lb-ft mild-hybrid 2.0L turbo four. For fans of the first generation—and that includes us—the new Evoque should be just as wonderful as the model it replaces, offering just a few extras to keep it competitive among newcomers like the Volvo XC40 and BMW X2. Differences between the new Evoque and the old one include a totally updated front clip featuring revised headlights that imitate those of the similarly stylish Range Rover Velar. The grille features a more architectural design that looks bold and modern, and the front bumper cover incorporates large side air intakes with distinctive strakes to impart some aggression into the little mug. 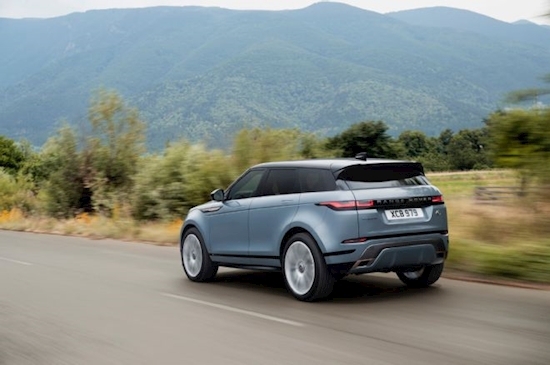 Around the side, the Range Rover Velar donates its aerodynamic pop-out door handles, and the Evoque maintains its predecessor’s blacked-out pillars for a floating-roof effect. Pronounced wheel arches (the fronts cut into the hood’s shutline) are another design carryover, and those openings can be filled with up to 21-inch wheels for an athletic look. Around the back, the Evoque keeps its chunky rear window spoiler and pronounced bootlid booty. Gone, however, are the blocky taillights, replaced by sleek, LED-fired units that look to be cribbed—yet again—from the Velar. 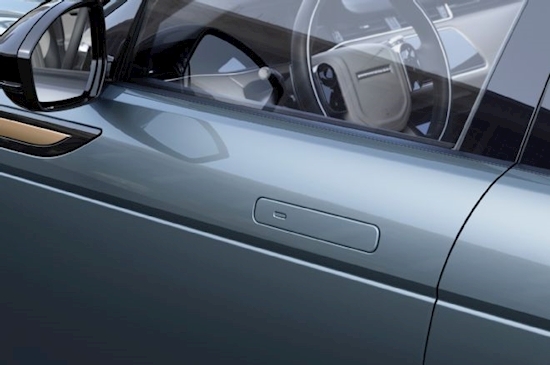 Between those lamps is a RANGE ROVER–branded piece of black trim, which emphasizes width, according to the company. A revised rear bumper cover makes an appearance. Now, to be totally fair, the 2020 Evoque is less of a top-to-bottom redesign and more of a significant revision of the current model. 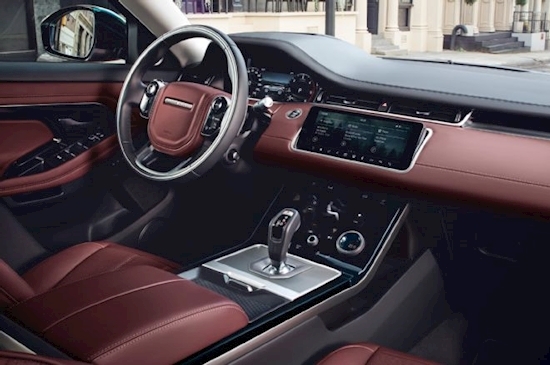 Key goals for this heavy update included expanding rear-seat room, improving efficiency, and adding Land Rover’s most modern infotainment and off-road technologies. Achieving the former is the work of a slight wheelbase extension, up to 105.6 inches from 104.8. That slight increase is focused exclusively on the rear seat, with knee room back there increasing 0.8 inch. Updates to the front seats’ mounting points also opens up a bit more toe room for rear-seat passengers, which should improve seating comfort in back a fair bit. Furthermore, the rear suspension has been revised, giving the little SUV 21.5 cubic feet of room behind the rear seat (an increase of 1.2 cubes). 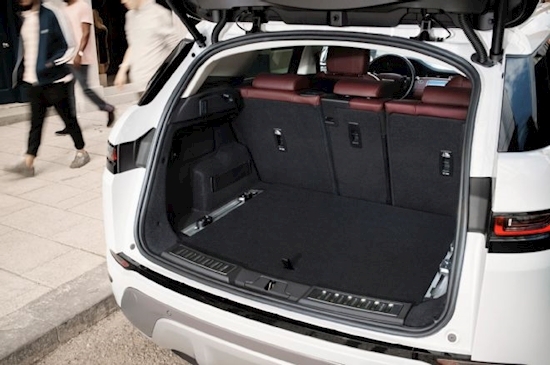 That space expands to 50.5 cubic feet with the rear seat folded. The 2020 Range Rover Evoque will be the first RR model sold on our shores with mild-hybrid technology, courtesy of a 48V electrical system. The system works through a lithium-ion battery and electric motor, which provide more seamless engine auto-stop and a small amount of electric boost for improved efficiency. That electrical capability comes thanks to Jaguar Land Rover’s Premium Transverse Architecture, which is an evolution of the current Evoque’s platform. Premium Transverse Architecture is reportedly 13 percent stiffer than its predecessor, reducing the amount of vibration and untoward noises that enter the cabin. No one is planning on taking a front-wheel-drive–biased, unibody crossover with 21-inch wheels down the Rubicon Trail, but the Evoque is still a Range Rover; thus, it boasts some impressive off-road chops. 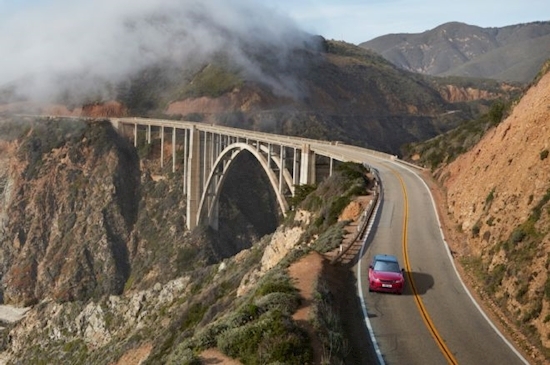 Predictably, the vehicle uses a lot of sophisticated technology to make all-terrain magic happen. 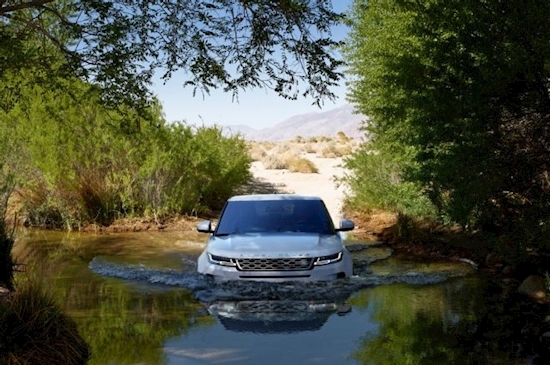 Wading depth for the 2020 Evoque is up about four ticks to 23.6 inches, and water depth can be monitored with the optional Wade Sensing system, which uses ultrasonic sensors to measure the depth of the water the Evoque is sitting in. We still think it’s probably a better idea to verify water depth before venturing out into the drink, but the feature is still a neat party trick. All-Terrain Progress Control, a sort of rock-crawling cruise control, makes an appearance on the 2020 Evoque as well. The system allows the driver to focus on selecting the correct driving line, putting the brake-accelerator onus on the SUV itself. Finally, the Range Rover Evoque incorporates the latest evolution of Land Rover’s Transparent Bonnet concept, called ClearSight Ground View. 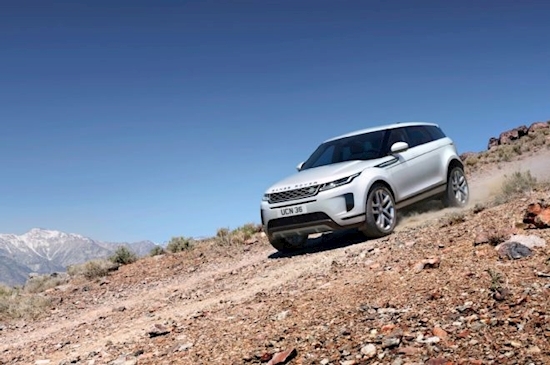 The feature projects an image of the terrain directly in front of and beneath the Evoque’s front wheels to the infotainment display, making hill ascents, tight trails, and even city parking spaces less daunting. While we tend to shy away from too much electronic involvement when we’re trying to bug out from modern life off-road, this feature does seem very handy when cresting a hill with the windshield showing nothing but sky. 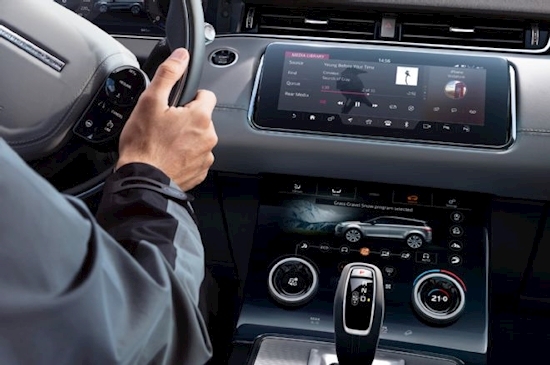 The 2020 Range Rover Evoque’s interior is heavily revised, including the addition of Land Rover’s InControl Touch Pro Duo infotainment system. Available as an option, InControl Touch bundles almost all of the vehicle’s controls into two gorgeous pieces of glass, including HVAC, audio, and Terrain Response terrain-management menus. Apple CarPlay and Android Auto make an appearance on these pretty, but somewhat difficult to navigate, infotainment screens. 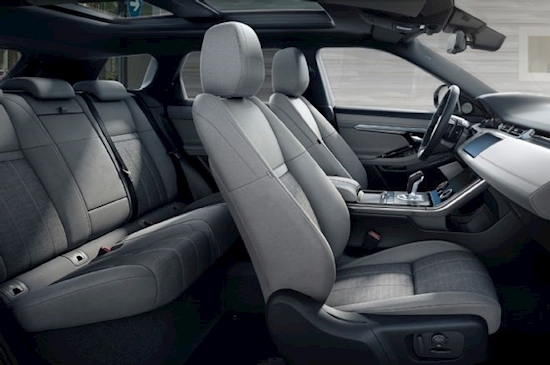 We love love love the Kvadrat interior option found in the Range Rover Velar, for all the world like it was made from materials found in a Saville Row tailor. We expect it to have a similar effect on the Evoque’s cabin, giving it a distinctly British feel that stands out from the leather- or leatherette-lined interiors of BMW and Mercedes-Benz compact SUVs. The 2020 Range Rover Evoque, revealed today in England, will be more fully fleshed out in the months to come. As such, the company says we’ll have to wait until the 2019 Chicago Auto Show in February to learn pricing and efficiency specs of the new SUV. But until we learn more, we’re confident that Land Rover’s significant revisions to the compact Evoque will keep it competitive among its hyper-stylish competition. 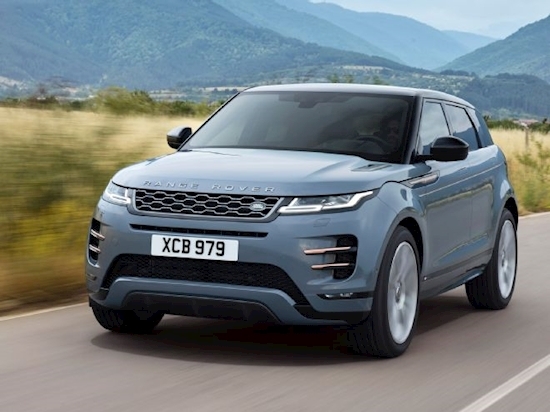 With more efficiency and greater capability on offer, along with styling that belongs in a museum of modern art, the 2020 Evoque will probably continue to be a hit with customers.